While Verizon has some of the best coverage in the country, there are places where it’s not that great. This is especially true when inside a brick building or deep within an office building. It’s also the case in areas where building codes are stringent to minimize damage from earthquakes and hurricanes (Florida for example). Verizon came up with a solution by offering a wireless network extender. These extenders are made by Samsung. These work real well in that they act as a repeater taking in the cell signal then re-transmitting within your building. The issue is that the deeper within your building you place this extender, the further it is from your window and less likely it is to receive a GPS signal. In order to receive a GPS signal, the GPS antenna must be able to see the sky where the satellites are living. No sky, no satellite signal. Even worse, no GPS signal, no extender functionality. The GPS signal is used to provide location services for 911 calls in case of emergency. The software within the extender is intentionally designed to disable the extender unless there is a consistent GPS location so you need to get a consistent, accurate and strong signal if you want to use these extenders. Fortunately, Samsung incorporated a little understood feature into their extenders called an external GPS antenna. You can purchase an external antenna for your extender. 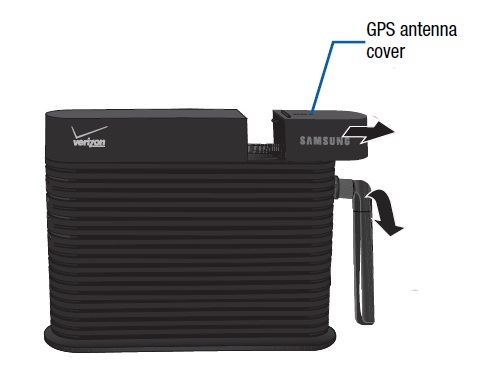 We have always liked the External GPS Antenna for Verizon Samsung 3G Network Extender with 25ft Cable because of the superior gain, but any antenna will work nicely. The higher the gain number, the stronger your signal will be. Be sure to purchase an antenna that has what they call an SMB connection. It must have a female ending since the extender has the male end. The cable length that you need will be determined by the length from your window to your extender. The antenna does not have to be placed outdoors. A windowsill will work well as long as there is a clear view of the sky. Don’t place it in a window that is obstructed by trees or a larger building. We received a large number of questions on how to attach an external GPS antenna to the Verizon Wireless Network Extender. We even have users who buy the GPS antenna and try to attach it to their phone. We had one person that somehow successfully pushed the ending into the audio port of an iphone and wondered why it wasn’t helping. Hopefully this article will help everyone and prevent mistakes like this. Attaching the antenna is quick, easy and helps immensely to obtain the 911 signal. Detailed instructions on how to do this can be found in the user manual or in this excellent video. Many think they remove the current antenna and that the external antenna attaches there. That’s not where the antenna goes. The key to installation is knowing where the secret compartment is located. Look at the top of the extender near the back and you will see a small compartment door that says ‘open’. Open it up, pull out the adapter and that’s what is used to attach the antenna.